The aim of Irish Therapy Dogs’ Reading for Fun programme is to improve the literacy and communication skills of children. In the classroom setting children often feel self-conscious and nervous if they have to read aloud to their classmates. 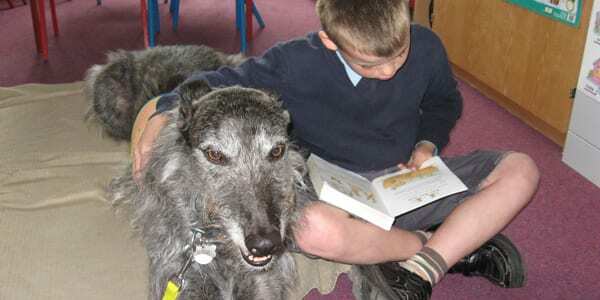 The Reading for Fun Programme encourages the children to read to a special reading ‘friend’ – in this case an Irish Therapy Dog. The dog is a captive audience who does not judge or criticise them, never laughs at mistakes and so makes reading an enjoyable activity for them. The children relax while reading to the dog and this gives them the confidence needed to read aloud. With improvement in their literacy and communication skills their self esteem and confidence grows. Children bond well with a dog and so it can increase their communication skills, confidence and self-esteem. Dogs are non-judgemental, they don’t criticise and have a calming effect. The literacy level of children who read to dogs improves far quicker than that of those who read to their peers.